Anderson was promoted from Triple-A Lehigh Valley on Monday, Todd Zolecki of MLB.com reports. Anderson will take the place of David Robertson (elbow), who was sent to the injured list in a corresponding move. 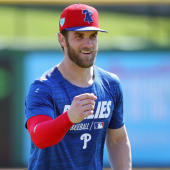 The right-hander has primarily worked as a starter throughout his career and should offer length out of the Phillies' bullpen during his time with the big club.